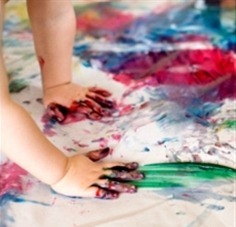 Child care, education, games, safety Childcare: Explore Painting with Your Child! Explore Painting with Your Child! What are the benefits of painting to young children? We all know, painting helps children to develop their Physical, Intellectual, Language, Emotional and Social skills. Lets see how? Children use their hands, makes hand-eye coordination. They develop gross motor (usage of arms) and fine muscle (pincer grasp) skills. These muscle skill development are especially important for future reading and writing success. 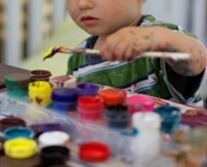 Children improve their creativity, discover the colours, and find out how to mix new colours? They learn early science, like materials, shapes, shadows. 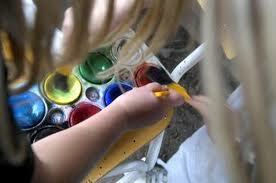 Children remember the object or the person they want to paint, and use their imaginations as well. Painting helps children to understand spatial relationships and composition. 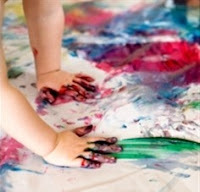 Painting is not an experience which particularly develops language, but Children always discuss what are they painting. They explain to you who, or what is on the picture, what are they feeling or what experience they had. Painting in particular often allows children to express emotions. Psychologists often use paintings to evaluate the mental and emotional condition of children.. Feelings that children are unable to put in words can often be expressed more easily through drawings and paintings. Above of this successful painting makes children happy. As they get more experience they will be quicker and more precise. They learn to be proud of their accomplishment, and they learn, that it is OK to make mistakes. Although spontaneous painting is not a social activity, working as a team helps social development. Adults can help children in painting, which helps to improve their relationship. Children learn to work cooperatively with others, they may learn how to resolve conflicts in peaceful ways and they may learn to share things or taking turns. What You will need for painting? Non spill paint pots - can be made from empty washing up liquid bottles. Cut in half and insert the top half into a bottom half. Occasionally introduce different techniques e.g. finger painting, bubbles, printing. Remember: Do not force children to use non-dominant hand. Allow them to paint what they want.